A lot has gone on in the last 3-4 weeks. We are right at 18 days until the beginning of summer vacation. Can you feel it? It’s pretty palpable in our house. I was reviewing my credit card statement and discovered that my son had signed up for the May SAT. Missed the early deadline too, as there was a late fee… Alas, he set it up on his own, using our joint credit card, which was great. He’s sometimes not too into sharing details of his life. Boys. He sat for the May 5th test. 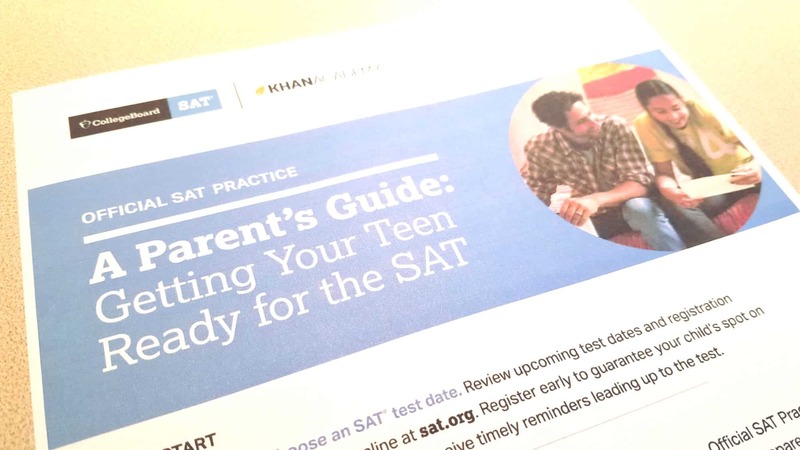 At his school, they do a PSAT in both sophomore and junior years, so he was familiar with the test, which is way more than I ever was back in my day. But I still encouraged him to do something extra prep. When I asked him if he’s doing anything, he said “yes”. I asked “what”, and he said Khan Academy. Cool. I truly don’t know how much time he spent on that but I’ve left it up to him. Overall, he gets pretty good grades and is really responsible so I feel like this is not a battle I need to fight. Saturday morning came around, he was pretty much the first one up, and on his own, off he went around 7 am. He came back and few words were spoken. It was done. I’m plugged into the College Board communications to him and so last week, I received the email that the results were in. So I checked. Naturally, I was curious. He went up 20 points over the last PSAT, which had been up 20 points over the prior PSAT. So he was moving in the right direction. Nothing monumental, however. We haven’t even discussed it. I’m not sure he’s bothered yet to check his score. So fast forward to yesterday. I attended the Pacific Northwest Association for College Admissions Counseling (PNACAC) annual conference in Spokane, WA which is an easy 2-hour drive from my home in the Tri-Cities. I recently joined this association which is self-described as “an education association of secondary school counselors, college and university admission officers and counselors and related individuals who work with students as they make the transition from high school to postsecondary education”. Notice, there is no “financial advisor” listed in there and I’m not certain, but it was likely that I was one of few to no other financial advisors in attendance. However, I feel to better serve my clients, I need to know more about the whole college admissions process and this is one of several associations to learn from. So I joined. It started out as a beautiful summer-like day until lightning suddenly struck and scared the bejebees out of us sitting next to the floor to ceiling window. A group of Independent Educational Consultants had gathered for a roundtable and me not having an exact group to identify with, joined in with them. This conference focused on the admissions side of things but sorely missed topics related to affordability. I’d like to see topics like increasing costs and tuition or the long-term impact of student loans on students. I happened to talk to one of the organizers, Claire, a great gal, and she noticed I was a financial advisor. We talked about needing more financial topics, so I’m thinking I might throw my hat in for a session. A real upside was we got to hang out at the beautiful Gonzaga University campus for the day. Then, jump to today. Funny enough, a spontaneous Zoom call arose among several of my XY Planning Network colleagues to discuss some cases surrounding student loans, where things stand with the PSLF, Public Service Loan Forgiveness programs. We had some really strong student loan planners on the call. Ryan Frailich, Breanna Reish, and my friend Ryan Inman who talked to us on my podcast, Financial Side of Life, Episode 4. You’ll recall that for his average client, young physicians, student loan balances are right around $280k. Some of the college loan situations these guys encounter would make your hair curl. Blows me away. I asked the question in trying to understand, do these students go into this situation knowing they will end up with this kind of debt, was it the plan all along, or is this just the way things turned out? I am not strong in student loans but I know where to go to get answers, these guys. Besides, my goal with college funding planning on the front end is to make it so my clients would never need the services of these guys, ever. I know that’s not good for their business, but I think they’d agree, it’s good for everybody in general. Sadly, there’s no shortage of inexperienced, stressed people coming out of college this summer with tons and tons of student debt. They’ll have plenty of future clients. The Future of Standardized Testing?? Back to my conference yesterday and the SAT. I attended a session on The Future of Standardized Testing presented by Ryan Kiick, from the Princeton Review. It surprised me to learn that he believes that SAT and ACT type tests are going away and soon. Many colleges no longer require them for admissions (although they are still important for merit scholarships). He thought that CollegeBoard and ACT will need to adapt. That they will create new tests, which might better predict the ability of the student to finish college or grit, among other behavioral things. I feel encouraged because we all have heard stories about that kid who takes those tests 10, 11, 12 times to get a better score. Nuts. Maybe tests will be off the table for my next kid to go to college in 2021. We’ll see. But for now, we focus on summer in our home.